In a survey conducted by the Insights Group, top companies considered that getting the best out of their people was one of their key issues. So how do you do this? 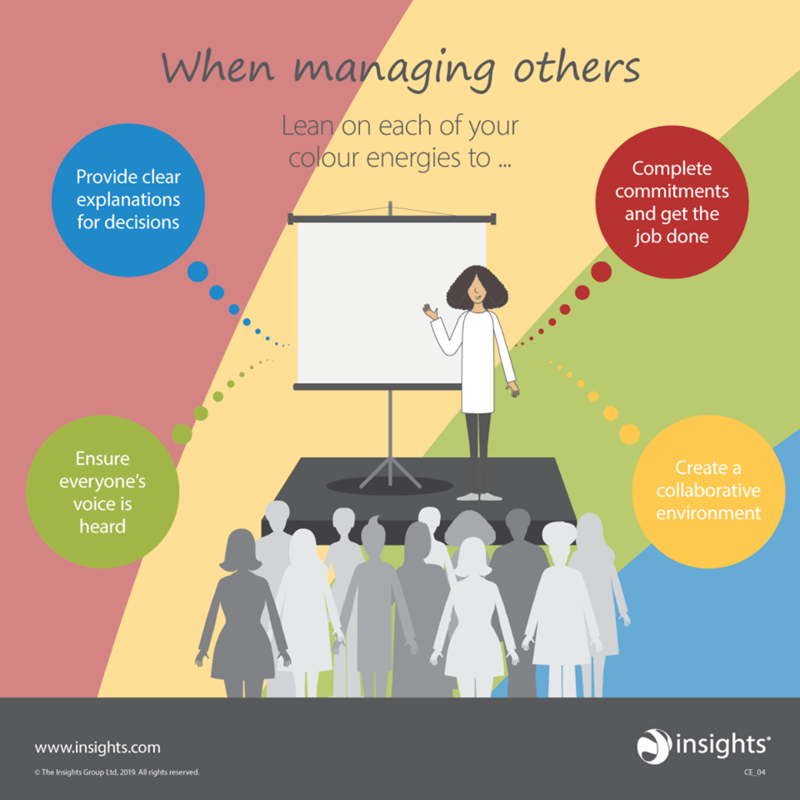 Insights Discovery uses a four colour model, comprised of Cool Blue, Fiery Red, Earth Green and Sunshine Yellow energies, to describe people’s strengths, styles and team contributions. Everyone has all four energies, although no one is strong in all four, and the unique combination of these helps to determine why we think each and behave the way we do. It is important that you set clear directional goals for your business and that your employees all know and understand what these are and how you want them to be achieved. Employees that can see the bigger picture and have an understanding of where they fit within this are likely to be more engaged in the business and more productive. Some managers advocate regular performance reviews, while others see the practice as outdated and damaging to employee relations. Whichever view you identify with, or if you’re somewhere between the two, two-way communication with your staff is essential. They must be able to raise concerns with you and you must be aware of how employees are performing. Equally, it is important to understand your employees’ temperaments and place individuals in the right roles. Every person is different. While an individual that leads with Fiery Red energy may thrive on having challenging targets set, those that lead with Earth Green energy may be put off by this and instead value time and space for reflection and personal connection. You may need to think with your Cool Blue energy hat on to see from the perspective of those that may appreciate having clearly defined objectives for each task, or with your Sunshine Yellow leading to relate to someone who is good at encouraging individuality and may need more flexible parameters to be able to explore creative solutions. Insights discovery helps you to understand your employees and allows them to better apply themselves through a greater understanding of productivity, communication and effectiveness as individuals and in teams. Training is also essential. If your employees don’t have the necessary knowledge and resources to perform at their best, it is up to you to provide this. This could come in the form of teaching them how to do a specific task or more broad subjects, such as assertiveness or commercial awareness. Well-trained staff are empowered and more productive. Performance Workplace Development develops bespoke strategies which can be implemented through training and development programmes, mentoring and personality profiling to help you get the best out of your employees.